Dewitt County lies at about forty-five miles from Copano Bay, on the Gulf Coast Plain in southeastern Texas. Cuero is its county seat and its largest town. Named after Green DeWitt, an empresario, the county comprises 910 sq. mi. 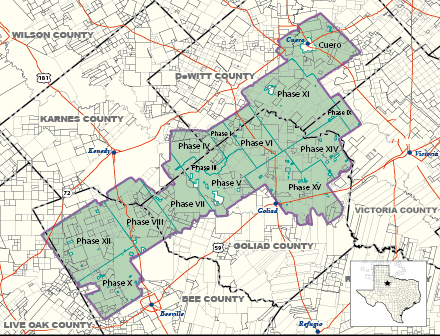 and is bounded by the counties of Victoria, Goliad, Karnes, Gonzales, and Lavaca. For the past two decades, oil wells in Dewitt County were not much productive until the oil boom which began in 2010. Since its production history, 5,086 wells have been drilled. Dewitt County has produced 4,736,344 barrels of oil as of August 2014 – the highest recorded yet – and is showing a lot of promise. So far, there are 774 producing leases and 62 producing operators. Burlington Resources O & G Co. LP, Chesapeake Operating Inc., Devon Energy Production Co. LP, and Sabine Oil & Gas LLC are some of Dewitt County’s top producing operators. 018395 AMERICAN INT’L ENERGY CORP.
“Oil Wells and Production in Dawson County, TX.” Dawson County, TX Oil Wells, Operators, and Production Data. Texas Data Applications, LLC. Web. 1 Feb. 2015. <http://www.texas-drilling.com/dawson-county>. Roell, Craig H. “DEWITT COUNTY.” Handbook of Texas Online. Texas State Historical Association, 12 June 2010. Web. 31 Jan. 2015. <http://www.tshaonline.org/handbook/online/articles/hcd07>.